EVGA Corp. on Tuesday announced that it has developed the EVGA GeForce GTX 285 Mac Edition graphics card. It costs $450. This news confirms a report that first surfaced in April that Mac users would get a GeForce GTX 285 card. 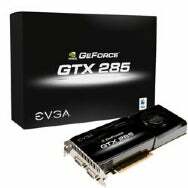 The GeForce GTX 285 is designed to work in 2008 and 2009-era Mac Pro systems, both of which are equipped with PCI Express 2.0 interfaces. It sports 1GB of DDR3 graphics memory on board, and features two Dual-Link Digital Visual Interface (DVI) ports, each capable of driving a 30-inch display at 2560 x 1600 resolution. As the name implies, the card is based on Nvidia’s GeForce 285 graphics chip — currently the high-water mark in Nvidia’s single-chip systems for consumers. While Nvidia graphics cards and chips have been available in Macs for some time, this is the first time a third-party manufacturing partner of Nvidia’s has offered a GeForce card in a Mac version. EVGA expects the graphics card to appeal to gamers, graphic designers, art directors, illustrators, video producers, photographers and others looking for maximum 3D graphics performance out of their desktop systems. Inside is a microprocessor clocked at 648MHz, equipped with 240 processor cores. Memory clock speed is 2584MHz, with memory bandwidth measured at 159GB/sec. PC hardware sites generally regard the GeForce GTX 285 as faster than any single-chip board competitor ATI has to offer. ATI offers its Radeon HD 4870 as an add-on option for Mac Pros as well; that card began shipping in May around the same time that Mac OS X 10.5.7 was introduced. The card is available now from Apple’s online store for $450. An EVGA representative told Macworld that the card will be available from other online retailers in the coming days, as well.